Research has long shown that the Earned Income Tax Credit (EITC) for working families significantly encourages work—especially among single mothers—and reduces child poverty more than any other existing policy tool. Although the EITC is largely a temporary support, new research by the Center on Budget and Policy Priorities indicates that this tax credit generates broader benefits that extend well into adulthood for the recipients’ young children. These children perform better in school, are more likely to go to college, and earn more when they reach adulthood. For instance, a $3,000 boost in income from the EITC during a child’s early years is associated with a boost in educational achievement that is equivalent to an extra two months of schooling. 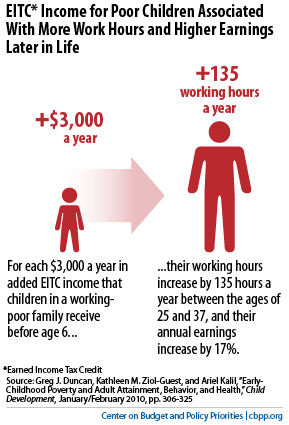 And as illustrated in the infographic below, a boost in income from the EITC during a child’s early years can contribute to a significant increase in earnings in adulthood as well as increased work activity for individuals between the ages of 25 and 37. The maximum North Carolina EITC available to working families was below $300 in 2012, building on the successes of the federal credit. Despite the volumes of research, state lawmakers recently signed off on a bill to cut the state EITC to 4.5 percent of the federal credit in tax year 2013 and to get rid of the credit thereafter. The result is a $105.2 million tax hike on nearly 907,000 working families beginning in tax year 2014. As lawmakers pursue tax reform, North Carolina will be better served if we maintain this proven policy tool for working families doing their best to work, support their children, and move up the economic ladder.